News from World Scouting - We have all won an Award! National Commissioner Youth Empowerment - Apply now to Ensure our Youth Voices are Heard! 100 Years of Cub Scouts and We Are Celebrating! How do you Plan Do Review? World Scout Foundation Events coming to Australia! Bindi Irwin announces Australia Zoo Tiger Cub name as Scout! Record your Clean Up Australia Day Hours as Messengers of Peace Projects! Apply to be the next International Commissioner! Come to the next New Zealand Jamboree! Applications now open. Where do Scouting Youth stand on the Ladder of Youth Engagement? Asia Pacific Region Scout Photo Contest Winner Announced! What's your Cub Scout Story? What does the Section Transition Experience look like in your Group? Have you Heard of the Scouts of the World Award? Where Can Your Scouting Qualifications Take You? You’re a Messenger of Peace - Now Wear the Badge! Walkabout Award and Camper Award - Two New National Badges Scouts Can Earn! What's New from the Youth Program Review? Have you Tried Scout Central Yet? Breaking the Cycle - Bullying is not part of Scouting. Have you read the Wolf Cubs Handbook? Winner of the 2017 Scouts Australia Clean Up Australia Day Badge Design! Congratulations, Belinda, the Cub100 Competition Winner! We’re Seeking Change Makers - Join the National Youth Council! Get Set as AV2018 Applications are NOW OPEN!! What Does Plan>Do>Review> Actually Look Like? Scout Groups Raise $1.6m From Bunnings Barbeques! 100,000 Badges Recorded on Scout Central! What Goes on at Chatswood – the National Support Team of Scouts Australia? New Zealand Rover Moot Applications now Open! Have you tried this new way to fish? Are you Ready for Clean Up Australia Day? Complete your Queen’s Scout and Receive the Certificate 3 in Business! New Program Concepts Workshops Now in Every Branch! Share your Project in WOSM’s Diversity and Inclusion Challenge! YOU + LEAD Programs Commencing Soon! Apply Now. Looking for a Quality Hiking Boot at a Great Price? Are you Someone with an Environmental Idea that Could Change the World? Applications to Attend AV2018 are Closing Soon! Do you want to be part of the Transformation of Scouting in Australia? #HikeItOut on your Next Adventure! Did You Watch Your Local Scout Show? Australian Scout Promise and Law Resources Out Now! Lead us Into the Future. Be a Pioneer. World Jamboree Applications Opening Soon! Two Major Event Opportunities Now Open! Want More Adventure? Check out These Opportunities! Are you a Member of the Lord Baden-Powell Society? Suggest a Name For The New Youth Program and You Could Win a GoPro! Closing Soon: Creative Media and Design Festival! Winner of the 2018 Scouts Australia Clean Up Australia Day Badge Design! 25th Australian Jamboree Fund - Help Us Help Scouts! Become International’s Extra Pairs of Eyes and Ears! Adults in Scouting - Get Industry Qualified Now! 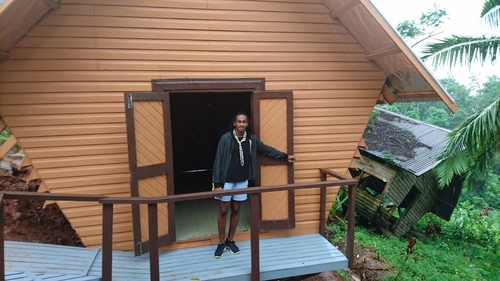 A group of six South Australian Scout members have given much needed hands-on assistance to the cyclone-devastated Jean-Murray Scout Training Centre in Suva, Fiji. 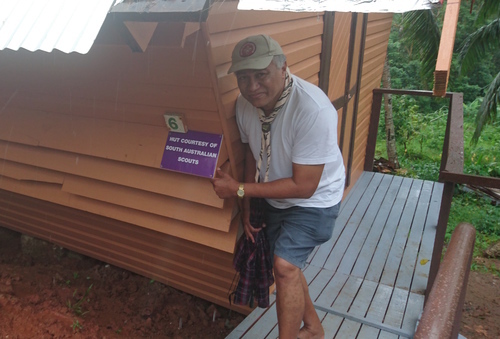 Arriving two weeks after the cyclone, the Scouts’ helped rebuild two training huts. The service project, sponsored by the South Australian Branch, was an adventure for the six Scouts who worked tirelessly given their strict timeline and resources. During their visit, much needed fishing equipment, clothing and tools were donated when visiting the worst hit villages on the Koro Island with Joji, an executive member of Fiji Scouts. The Fijian Cyclone Appeal, co-ordinated by the South Australian Branch and contributed to by Scouts from around Australia, will also provide financial support in the order of AUD $3810.40 to support Scouting in Groups most affected by Cyclone Winston. The Appeal ran throughout March and April. It is through projects like these that Scouts from Australia are helping to create a better world and acting as Messengers of Peace. 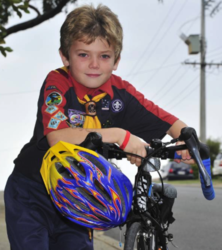 Seven-year-old Scout Laurence Hoolahan progresses towards his Joey Promise Award by riding his bike 76km all in the name of charity. Accompanied by Scouts from his Group and adult supporters, Laurence is raising funds for 1st Falcon Scout Group and a Filipino Children’s Charity. Laurence is hoping to raise $3000 through crowdfunding and collecting donations from his community. Read the Mandurah Mail article here. Scouts Australia has formed a Contingent to attend the 21st New Zealand Jamboree which will take place on New Zealand’s South Island. So far, 81 Scouts, Venturers and Leaders have submitted an application to attend. There is a lot of room left in the Contingent and we would like to take 5 times that number! New Zealand Jamborees are unique because many of the activities differ from those at Australian Jamborees. White water rafting is one example. To make it even better, every Scout will have the opportunity to participate in a light aircraft flight! Plus there is all the fun of mud, water and bush related activities. Australian Scouts in Patrols will be hosted by New Zealand Troops, which allows Scouts to experience a great cultural exchange. The Australian Contingent departs Australia on 26 December 2016 and will have a 3 night stay in Christchurch before the Jamboree. For further information on costs and how to apply please, go to www.auscontingenttonz21.com.au . You can commence an application here on the registration portal. We are putting together a very exciting Post Jamboree Tour of the South Island which is often described as all the world’s scenery in one place. It’s not just snow covered mountains, you will find yourself in New Zealand’s adventure capital Queenstown and the great South Land. Numbers are limited for what will be a very popular tour. The Post Jamboree Tour will commence on 7 January and end on 15 January 2017. Every year, one in four young people aged between 16 and 24 years will experience a mental health problem. Because there is so much going on in this period of their life, mental health problems can disrupt a young person’s development in a whole range of areas. The National Mental Health Sub-Committee has been working on ways that Scouts Australia can assist in addressing these problems. On the 30th April and 1st May a training course was run in Canberra for 20 Venturers from the ACT Branch. The Teen Mental Health First Aid Course is an adaptation of the Mental Health First Aid (MHFA) Course, but aimed specifically at teenagers. The course was designed for year 9 High School students and this weekend was the first time that it had been run for a community group. Dr. Claire Kelly, Director of Youth Program at MHFA ran the course. Her passion is in the area of the mental health of young people and minimizing the impacts that mental health problems can have on development, education outcomes and long-term functioning. We are very privileged to have her onboard. In the Scouting movement, should we engage youth through manipulation, or have young people initiated projects, decisions shared with adults? 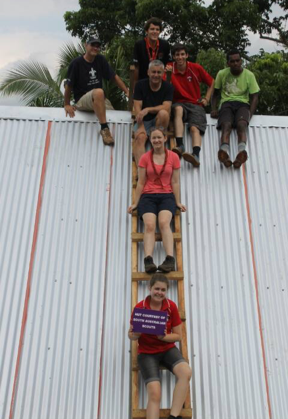 The Ladder of Youth Engagement which has been adopted by WOSM, shows the differing levels of youth empowerment. 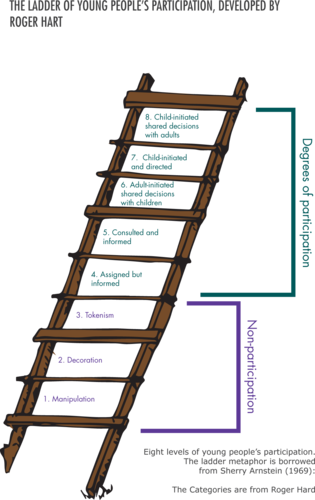 In the promotion of its Youth Involvement Policy, released in early 2015, the World Organisation of the Scout Movement (WOSM) uses Roger Hart’s ladder concept to illustrate how Scouts can consistently involve youth to higher rungs of the ladder. Manipulation: Occurs when adults use young people to promote a cause they feel strongly about, but do not help young people to understand the cause. Decoration: Young people are often asked to dress in a certain way and perform to support an adult agenda, usually with the aim of prompting an emotional response on the part of adult viewers. Tokenism: This is a situation in which young people are asked to speak before conferences of groups of elected representatives, but without learning anything substantive about the issue, determining their own position or consulting with other young people, who, it is claimed, they represent on the part of adult viewers. Assigned but informed: This indicates that although the young people’s participation is decided for them, they understand the aims of the project, who decided that they should be involved and why. Consulted and informed: The project is designed by adults, but young people’s opinions are taken seriously in any decision-making. Adult-initiated projects, decisions shared with youngsters: Young people have an integral role in making decisions, rather than a consultative status. Young people-centred and directed projects: Such projects are infrequently seen, because few adults are willing to relinquish complete control to young people. Because of lack of adult involvement, such projects often fall to become a true community concern and remain marginalized. Young people initiated projects, decisions shared with adults: Adults are involved as facilitators for the goals of the young people, directing them to needed resources, providing support in developing necessary skills, and helping them to evaluate. This type of relationship enhances learning for the young people, builds a sense of community ownership of the project, and provides adults with the opportunity to learn from the enthusiasm and creativity of young people. Think about how the youth are currently involved in decision making in your Mob, Pack, Troop, Unit or Crew. Now consider the level that youth SHOULD be involved in decision making. Scouts who visited theCrate@AJ2016 were able to interact with this ladder and interpret where they think the different levels should be placed on the ladder rungs. Wanting to move up to higher rungs? Click here for an infographic with examples! The Youth Program Review strongly believe in the importance of empowered youth and are creating a future youth program strengthening the involvement of youth in decision making. 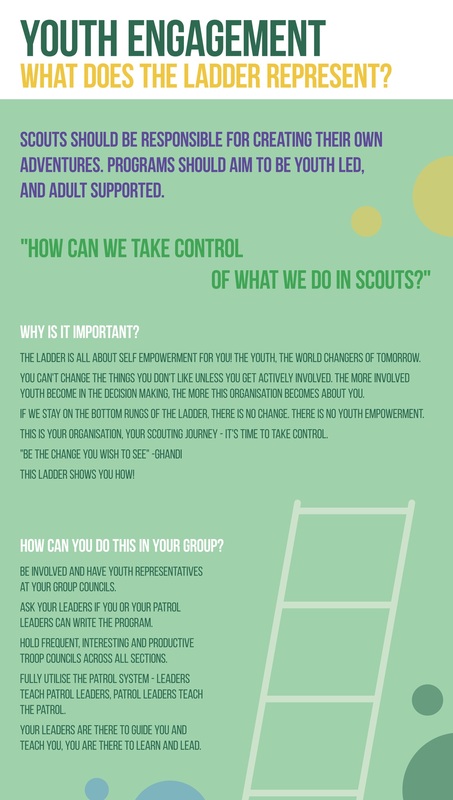 If you want to find out more about the Ladder of Youth Engagement, read the World Scout Youth Involvement Policy here. 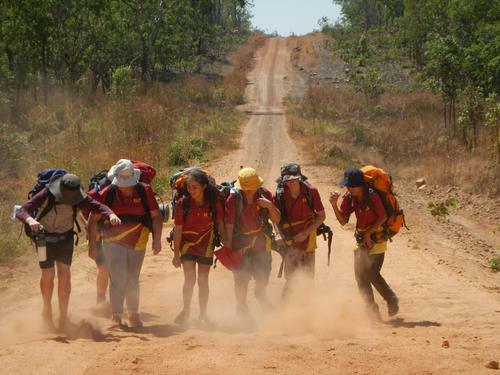 Congratulations to Australian Scout Elisha Pettit from the Northern Territory for winning the gold prize in this year’s 14th APR Scout Photo Contest with the entry ‘Kickin’ up the dust’. Elisha’s photo was selected from a total of 159 photos from 11 countries as judged by Scouters and professional photographers. Congratulations also to Chris Ballard, for his Bronze winning photo taken at AJ2016. These winning entries will be used in major publications viewed by Scouts from around the Asia and Pacific Region. Read the press release on the other winners here. Elisha Pettit's First Placing "Kickin' up the Dust"
Chris Ballard's - "Higher and Stronger together"
Are you a Scout or Venturer interested in a once-in-a-lifetime adventure with a Scout Jamboree in Mongolia? Mongolia is between China and Russia with a fascinating lifestyle, quite different to our own, but like us, have many enthusiastic Scouts. The next Asia Pacific Jamboree will be held in Mongolia 27 July- 2 August 2017, just over 12 months away. Rovers and Leaders are also welcome to join this amazing experience. The trip will include three days in Beijing, China then a journey on the Trans Mongolian Railway to the Jamboree site. During the Jamboree, and with 6 000 other Scouts and Venturers from different parts of the Asia Pacific, you will be doing activities you have never done before in your life. After the Jamboree, you and your Scouting friends will have a unique opportunity to stay with a Mongolian family - in their home. We will be away from Australia for 2 and a half weeks. A rough estimate at this early stage is a cost of around $3900 per person. So, start your fundraising now! We have ideas that might help you and your Group. Information sessions have started and will be held in all States. Our website will soon be launched. In the meantime, please contact Contingent Leader, Neville Tomkins for more information. You can also like us on Facebook. To help ensure the safety of our youth and Leaders, Scouts Australia and each Branch have tightened procedures for international travel. If you are travelling overseas with Scouting, you are now required to register on the Department of Foreign Affairs and Trade (DFAT) Smartraveller site. Go to the "Register your travel plans" section. At least one week prior to departure, you or your Contingent Leader must provide the International Office of Scouts Australia, and a copy to the National Office, of the list of participants of your group and their "in country" emergency contact details as well as details of the Next of Kin. 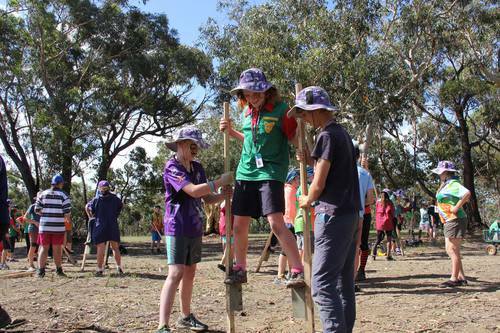 A Jamboree - whether it be in Australia or overseas - can be a highlight in Scouting. Arrangements are being planned now for our participation in a number of exciting international Jamborees. These include the 7th International Finnjamboree (July 2016), "Everthing is Possible" Jamboree in Thailand (Dec 2016), 21st NZ Scout Jamboree (Jan 2017), the Norway Jamboree (July 2017), the 31st APR Jamboree in Mongolia (July/ August 2017), and the 24th World Scout Jamboree (North America, 2019). There are also other international events as the New Zealand Moot (Easter 2017), the BP Scout Peak Expedition in Nepal (Sept 2016) and the 15th World Rover Moot (Iceland, July/ August 2017). 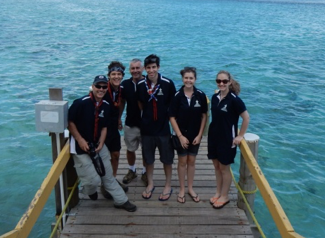 Remember to keep checking the Scouts Australia International website for new opportunities. Scouts Australia, and its International Office, is committed to providing youth with every opportunity to be involved in decision-making, consistent with the policy of World Scouting. To this end, we encourage youth to apply for Contingent Management Team positions for International Contingents. With the benefit of this experience, and greater personal confidence, we then encourage youth members and young adult Leaders to apply for Contingent leader positions. Our participation in the annual NZ Moot, and the BP Scout Peak Expedition are examples of youth led contingents. The winning entry will also win a Snowgum Adventure 1700 Sleeping Bag, value $169.95, courtesy of Inspire Apparel, operators of scoutshop.com.au, and makers of our Scouts Australia uniform. The Olympic Games are coming up later this year, so how about your Scouts consider programming an Olympic Games night! The 2016 Olympics games are being held in Rio de Janeiro, Brazil in August, so start building the excitement now! See a selection of Olympic programs here!